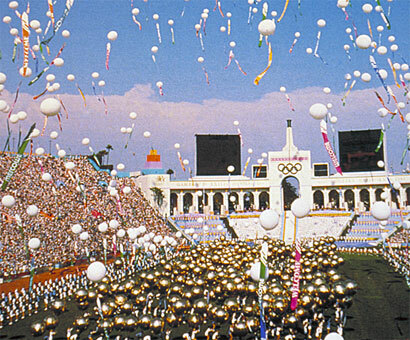 The 1984 Los Angeles Olympic Games marked the beginning of a new approach to the Ceremonies - one that created a new standard for public performance and spectacle. Peter V. Ueberroth and David L. Wolper contracted Ric Birch as Director of Production for Ceremonies and that led to the seamless creation of unforgettable images: Kinny Gibson the Rocketman blasted into the Memorial Coliseum: 84 grand pianos perfectly synchronised for Gershwin's Rhapsody in Blue: an audience card trick that formed the flags of all participating countries: an 812 piece marching band that still ranks as the greatest ever formed: and in the closing ceremony a flying saucer that baffled many spectators who were watching its appearance live. The ceremonies brought a new spirit of confidence and fun to the Olympic Games which had suffered almost a decade of bad news prior to Los Angeles - a fact that's almost forgotten now as television rights and sponsorship levels have transcended anything imaginable just 35 years ago. Ric Birch and Spectak were there at the beginning.